The ATOP remains forever grateful for United Airlines' eight year support of the Airline Training Orientation Program. Since the program's inception in 1994, nearly 4000 pilots have graduated the ATOP…many of them now flying for United. Due to circumstances beyond our control, we found it necessary to terminate our relationship in March of 2002. The ATOP is pleased to announce that both the JetBlue University and the American Airlines Flight Academy serve as the new hosts for the ATOP. We have opted to leave the article below appended to our web site since, although venues have changed, the spirit of the ATOP mission is so very aptly conveyed by the writer. That same spirit is assured as the ATOP moves into the future with the new associations. The following article is featured on the AVweb internet magazine site. Ever fantasize about what it might be like to fly heavy iron for a major airline? Got a spare $475? Well then, have we got a treat for you! There's a little-known weekend program that offers pilots of any experience level the opportunity to go through a grueling 10-hour cram course on Boeing 737 systems and procedures, plus two hours in a 737 cockpit procedures trainer and two more hours flying a full-motion 737 simulator. AVweb reader Erik Sundquist, a low-time non-instrument-rated private pilot, took the course and actually lived to write about it. It's a cold November Friday evening. I am standing in the baggage area after deplaning a Boeing 737 at Denver's International Airport. Could it be that I can actually learn the basics of flying Boeing's most prolific jet in just two days? I am asking myself why I had abandoned my wife, pregnant with our soon to arrive twin boys, to attend a relatively low-profile program known as Airline Training Orientation Program (ATOP). For some curious reason, when I saw the ATOP ad in a pilot magazine, I felt "the calling." It was as if I were being summoned like the character in "Close Encounters of the Third Kind" who embarked on a pilgrimage to Devil's Mountain for some mysterious and unknown reason. ATOP is an independently operated company which has the cooperation and support of United Airlines for the primary purpose of introducing prospective candidates to the world of the professional airline pilot. The concept was presented to UAL in 1993 by a chap named Wayne Phillips. Aside from being an ATP, B737-rated, FAA Pilot Examiner, and a contractor at the United Airlines Flight Center in Denver, Phillips is very active in aviation career education. His career-oriented writings have been featured in many national magazines and his aviation career workshops have been hosted by the nation's finest aviation colleges and flight schools. Years ago, Phillips had a vision. He reasoned it would make sense for aspiring career aviators to experience what it is like to train and fly just like a major airline pilot before investing thousands of dollars and many years of their lives. He likes to say that the ATOP allows a prospective airline pilot to "test drive" his or her career before making that substantial commitment of time and finances. United Airlines seems to agree with him. 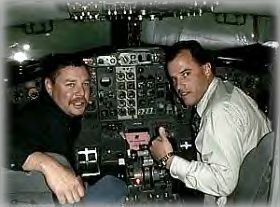 With the ATOP concept in mind -- wherein anybody, regardless of pilot certificates, ratings, or experience level could spend a few days of total immersion in the world's largest aircrew training facility -- Phillips made the pitch to Captain Bill Traub, UAL's Vice President of Flight Standards and Training at the time. Captain Traub said, "Go for it." ATOP is technically not a United Airlines program, since the airline is not in the business of conducting schools for low-time pilots looking toward a cockpit career, nor is ATOP officially endorsed by the company. However, much of the brass at the United Airlines Flight Center informally acknowledges ATOP and its mission to educate. Periodically, UAL managers and standards Captains will "drop in" to welcome ATOP students and explain the real world of hiring and flying at United. Located at the United Airlines Flight Center (UAL-TK) adjacent to the decommissioned Stapleton Airport in Denver, ATOP is a two day immersion into the B-737-200, the Cessna 150 of the worldwide airline fleet. For a $435 course fee the student will learn the normal operation of every system in the cockpit, be trained in start-up flows and techniques, receive flight procedures indoctrination, and spend two hours in the full-motion 737 simulator. The student will fly thirty minutes from the left seat as Pilot Flying (PF), 30 minutes in the right seat as Pilot Not Flying (PNF), and spend one hour as observer. Courses are normally conducted two to three times monthly over select weekends for eight to ten pilots maximum. It is 8:30 AM on day one. My nine other classmates and I are greeted by host, tour guide, lecturer, entertainment committee, and back-seat driver extraordinaire, Wayne Phillips. Introductions and a tour start the day, followed by ground school training on 737-200 systems which lasts from 10:00 AM until 4:30 PM. With large charts and an activity board known as a Cockpit Management Trainer, the class is guided through electrical, hydraulic, pneumatic, fuel, and control systems just to name a few. I felt like an undergraduate student again furiously scribbling notes attempting to learn in a few hours what professionals require years to master. Talk with anyone training at United -- there is plenty of time to meet with old-timer Captains and fresh new-hires -- and you will hear this time and time again: "Training at United is like taking a drink of water from a fire hose." And, believe me, we were doused! From 4:30-6:30 PM on the first day, we all alternated into a 737-200 simulator for start-up flows and techniques. Then, there's homework to keep it all together. It's easy to get caught up in the atmosphere of United Airlines. The Flight Center, which feels like a cross between a college campus and a professional building, is filled with people who make their livings in the aviation business. To the others in my class and myself, this is "Aviation Mecca." Walking the halls on short breaks for meals and "defueling", we browse the United Airlines artifacts which have been collected over the years. The place serves as a museum to the carrier. Vintage photographs of DC-3's and the pioneers who piloted them, old wooden propellers, and one vintage Link trainer are just part of the collection. Those of us who sign up for this dose of airline reality each have varying degrees of piloting experience. Four colleagues are relatively low-time CFIs plying their trade at various flight schools around the country, two pilots have more than 2,000 hours of flight time, two have some turbo-prop time, and finally two (including myself) have less than 100 hours total time. ATOP classes are generally composed of pilots in these experience levels; about 60% have accumulated between 100-1000 hours of flight experience and are on the very first rungs of the career ladder; about 35% are working professionals, including military instructors and commuter pilots; about 5% take the course just "for kicks." They want to play "Walter Mitty" for the weekend. Pilots are matched as closely as possible according to experience. I am paired with a 98-hour private pilot currently enrolled in a "private to MEI" program in Norman, Oklahoma. Unlike myself, who enrolled in the ATOP to develop a sense of career direction, my partner-in-crime knows precisely why he is there. He has no doubt flying for the majors is his ultimate career dream. After a full day of cramming on Boeing 737-200 systems and a late night study session with the cockpit trainer to review the flight profile and procedures, both as Captain and First Officer, it is back to the hotel for a short night of sleep in preparation for our 7:00 AM sim session. The 737-200 is the basic airplane in the Boeing 737 family. Of the more than 3,000 737s flying today, about a third are 737-200 models. United Airlines still has 25 in the fleet and expect to keep them until the year 2005. The model we are flying weighs in at 92,000 pounds, a far cry from the tiny 160 HP Piper Cherokee I usually fly. It will cruise at about 435 knots TAS thanks to two Pratt & Whitney JT8D-7 turbofan engines. Fuel burn for a typical mission is about (gulp) 6,000 pounds per hour as a "round number" from takeoff through landing. It is surreal to think that I am about to make the jump from a single-engine runabout to a full-blown megaton airliner in one leap. But, I am about to do just that...and realize a lifelong dream at last. My partner and I meet Wayne at the simulator lobby brimming with anticipation. As we settle in United's SIM #3 as attentive observers, we watch the CFIs in our group fly first. This was great since we had the opportunity to benefit from their "experience." The first CFI to captain the Guppy (as it is affectionately referred to in the industry) performs quite well flying the flight profile. It includes a takeoff, vectors in the Denver terminal airspace, a visual ILS to a touch-and-go, followed by a second ILS in IMC to a full-stop landing. In all, an hour's worth of 737 time, two ILS approaches, and two landings can be logged (ATOP uses United's "landing certified" Level D simulators). I'm up next! Like a kid getting on Space Mountain at Disneyland, I slip into the left seat and adjust myself into position. I think to myself as I slither between the seat and the yoke, "this is definitely not Microsoft Flight Simulator '98!" With the engines already started (the class performs start procedures on the first day), I push my toes hard on the top of the rudder pedals to release the brakes. As I slide the right and left engine throttles to the straight up, I watch the Engine Pressure Ratio (EPR), N1 and N2, EGT, and fuel-flow gauges carefully for normal indications. I call out to the FO, "Set takeoff thrust." My flying partner grabs my hand and moves the throttle with hand combination to 2.01 EPR for takeoff power. I cannot believe the realism. This IS the airplane! I feel the acceleration force and the bumps in the runway as we scream down runway 35L at DEN. "80 knots" calls the FO. "80 knots cross-check" I reply. As I anticipate the V1 speed callout at 134 knots, the "go/no-go" decision point on the takeoff roll, the takeoff is rudely interrupted by a master caution, a bell, and a red engine fire light from engine number two. For a moment I freeze, contemplating my options while commandeering the giant hunk of aerospace parts down the runway. Suddenly, I remember that the V1 call was not made by the FO so I quickly shut down power and press my toes as hard as I can into the top of the pedals for a timely stop. There is no need to worry about skidding as we are taught that these birds have the aviation equivalent of antilock brakes. Not much use for 99.9% of your flight, but real handy in a ground emergency requiring a quick stop such as an engine failure or runway obstruction ... like that Beech 1900 that just crossed the active runway ahead without a clearance. After taking a deep breath and hearing something from Wayne in the back about the use of the speed brake to assist stopping in an aborted takeoff situation, we are once again lined up for departure on 35L thanks to some simulator wizardry called "repositioning." This time V1 comes followed by the rotation speed of 136 knots. I coax the yoke towards me and pitch for 16 degrees on the attitude indicator. We lift off the runway with ease and begin to climb rapidly at 2500 feet per minute. I somehow remember my first call-out. "Positive Climb. Gear Up." My First Officer dutifully complies. At 1000 feet, I pitch to 9 degrees for the cruise climb attitude and begin to pick-up airspeed. "OK for flaps up" calls the FO. "Set flaps up" What else am I supposed to remember here? Uh, oh yeah! "Set climb thrust and complete after takeoff checklist." At this point I am flying in more ways than one! The adrenaline is pumping, my hands are getting sweaty, it is like a first date with someone you have a crush on. This was my first date ... with a Boeing! I level off at 8000 MSL and have the FO set fuel flow to 2300 pounds per hour, which uncannily results in an IAS of 230 knots. (Hey, it really does work the way Wayne said it would!) If I want 250 knots, I will set 2500 pounds of fuel flow. But, hey ... we are at 8000 MSL in the Class B Denver Airspace, and I do not want to bust the 250-knot speed limit. "United 456, radar contact. Make right turn heading 090 and maintain 8000," comes the call from ATC . "Roger, United 456. Right turn heading 090 and maintain 8000," replies the FO. I am learning the value of Cockpit Resource Management since my FO not only manages radio communications, but looks for traffic, deals with some of the systems glitches Wayne throws at us just to keep things interesting, and initiates most of the callouts. This leaves me with the ability to totally concentrate on my primary duty, to fly. This is just how the big boys do it. After the initial jitters begin to evaporate, I settle in and feel pretty good. I am actually flying a B-737 and not breaking too many FARs in the process! Heck, this machine is nothing but a Cherokee on steroids! I maintain pitch at about 4 degrees nose up to keep level. This animal is very pitch-sensitive but sluggish in roll, just as advertised in class. On the downwind now, ATC calls out, "United 456. Reduce speed to 160 knots and maintain 8000." I pull the throttles to idle and begin to slow down. When the airspeed indicator displays 175 knots, I call out to my FO who has already set flaps 5, "Set 2800 pounds fuel flow." And, there it is by the numbers: 160 knots IAS. The moment of truth arrives as I psyche myself up for the approach and my first-ever landing in a multi-engine airplane. I feel the eyes of the two CFIs sitting behind me. My preparation for this moment came just three days before. I am a VFR-only private pilot, so prior to coming to United for the ATOP, I did exactly what Wayne had encouraged me to do when I phoned to register -- I called my flight instructor and begged for a crash course (pardon the expression) in ILS approaches. We flew three ILS's on a PC simulator. This is a tad different! "Localizer alive," proclaims the FO. "Roger." I switch on the flight director and toggle on the altitude-hold function. Then I simply fit the orange delta triangle under the yellow wings of the flight director over and over again as the flight director and I guide the 737 down the electronic pathway toward the runway. Slowing to the approach speed of 134 knots, I make call-outs based on glide slope intercept. 1 1/2 dots. "Gear down." 1 dot. "Set flaps 15." 1/2 dot. "Set flaps 30." The FO scans the radar altimeter and announces, "1000 feet ... 500 feet ... 50 ... 40 ... 30 ... 20 ... 10 ..."
At 30 feet, I start pulling back power and the yoke concurrently to flare. It is just about 20 feet too late. CRUNCH! It is a carrier landing, but we survive! This Boeing 737 is on the runway in one piece, I complete my very first ILS and multi-engine landing in a jet! For the touch-and-go, my FO retracts the speed brake, sets flaps to 15, trims for takeoff, sets takeoff thrust, and we launch again. We fly the procedure a second time. This time, though, I choose an ILS approach in instrument weather conditions to 200 and a half, sky obscured. The second approach is either VFR or IMC, depending on the pilot's wishes. I say to myself, "No Pain, No Gain!" and opt for the approach in IMC. My peripheral vision picks up the approach lights about two miles from the threshold. Stay on the gauges. Got 100 feet to go, transition outside. Lead the flare a little bit earlier this time. Hang on. Keep it flat. Let it settle. Made it ... greased ‘er on! Reversers now to 1.8 EPR. Turn left. Ground point niner. After an hour break, my partner and I switch seats for the second mission where I experience the workload of the First Officer. I learn quickly that the FO -- or more accurately, the Pilot Not Flying (PNF) -- really manages the flight. It is a lot tougher than I ever anticipated. Thankfully, a script is provided that gives all of the essential FO callouts and duties. My limited knowledge of the electrical systems is tested when the generator on engine #2 goes offline because of a Constant Speed Drive (CSD) disconnect. Fortunately, Wayne helps me solve the outage via the Auxiliary Power Unit (APU) backup generator. I wish my wife could have seen me toggling all of those switches ... I must have looked great! We taxi in and shut down. Done! We did it! All of us in that class accomplish something that only a relative handful on this planet have ever done: fly and land a Boeing airliner. Granted, we have only the most rudimentary knowledge of the airplane when compared to someone with a B-737 type rating or who has endured the eight weeks of training that a United Airlines new-hire goes through. Yet, there is a tremendous feeling of satisfaction seeing the entry in my logbook: "1 hr. B-737, 2 B-737 ILS approaches, 2 B-737 landings." I know that I can do this! All of this is followed by a ninety-minute career briefing detailing the state of airline hiring and, in particular, what it really takes to get hired by a company like United. I relive these moments constantly. Like so many aviators, I have toyed with the idea of flying for the majors. For two days, I was able to live the dream...and maybe, just maybe, I'll do it. I do think anyone even remotely interested in a career with the airlines should take advantage of this unique and once in a lifetime opportunity for that "test drive." However, any aviation enthusiast searching for new experiences will also benefit from this training if for no other reason than to understand what goes on up front in one of those gleaming airliners. The two days fly by all too quickly. I am now seated in a United DC-10 poised for takeoff and the return flight to San Francisco. I visualize the crew completing the flows and checklists. I now realize fully why I had come to ATOP. It is the same reason I purchase "United Airlines Future Pilot" pajamas at the UAL-TK company store for my twin boys. Aviation is a passion. It can take us to new and exciting places. Thanks to a simple idea to allow us common folk to taste the fantasy and a major airline that continues to support it, I was ATOP the aviation world! For more information about ATOP, visit the ATOP Web site at www.B737.com The phone number is 888-338-3737 or e-mail them.